I am sure that all of you know that October is Breast Cancer Awareness month. I love when beauty companies do their part by donating proceeds of particular product sales, to Breast Cancer Research groups. It is so important that we all do our part when it comes to finding a cure for this disease that affects hundreds of thousands of women a year. In my heart, I KNOW that a cure will be found someday. 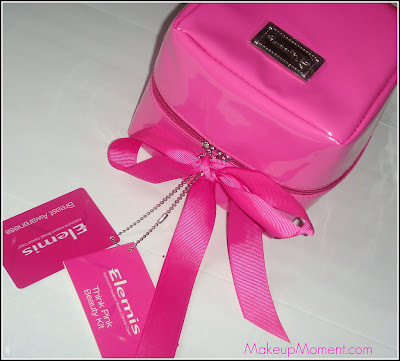 I recently had the opportunity to try the limited edition, Elemis Think Pink Beauty Kit ($55.00) and I couldn't have been more thrilled at the chance. I have never really been familiar with this brand before, so this skincare line was pretty new to me. 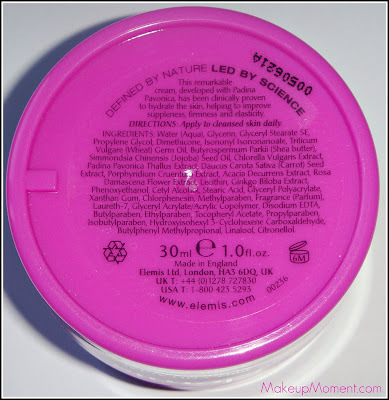 According to their website, Elemis combines "natural active ingredients with cutting edge technology" to bring the most effective and powerful therapeutic skincare products. Proceeds of every kit sold is going to be donated to Breast Cancer Care. Elemis pledges to donate $16,000! I love that this set included a HUGE and very SPACIOUS, cube shaped travel bag. I love that its pink, shiny, sturdy, and I know I am going to get loads of use out of it. 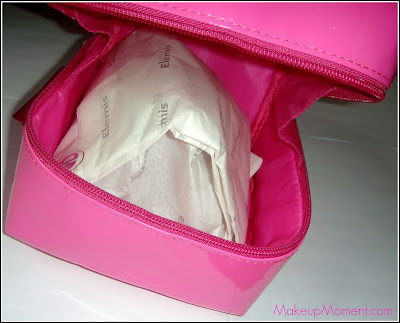 When I spend the night away from home, I usually have to bring two makeup bags because, all the items that I want to bring with me never fit in just one. Thanks to this bag, I can finally store all of my products with ease in just one bag. Love! 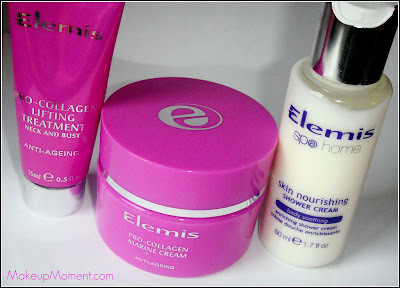 This travel bag housed three Elemis skincare products that I was so excited to try. Let's take a look! Elemis Pro-Collagen Marine Cream- Besides being Elemis' number 1 best seller, this anti aging cream is "clinically proven to reduce the appearance of wrinkle-depth by up to 78% and increase hydration by up to 45% in just 15 days." 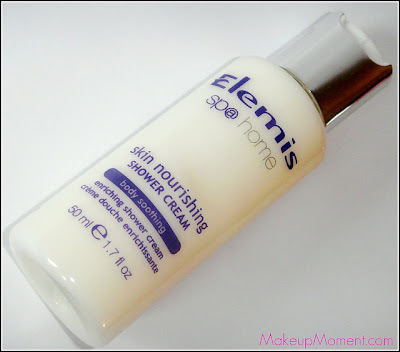 I have been applying this cream at night, after I cleanse my face and it feels just lovely. The consistency is smooth, creamy, it absorbs quickly into my skin, and although I do detect a fragrance, it is not overbearing. It smells pretty nice. Calming, in fact. My sensitive and acne prone skin has not reacted negatively, which is always a plus. After application my skin does feel very soft. I hope that the longer I use this face cream, the better the results will be. 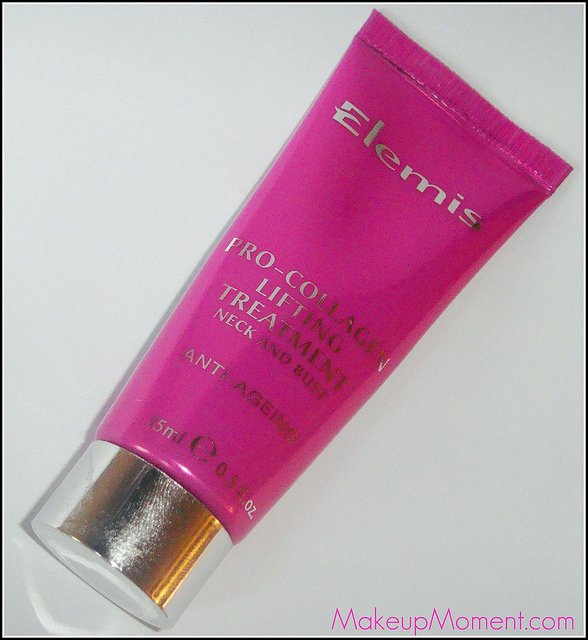 Elemis Pro-Collagen Lifting Treatment- This neck and bust lotion was a very nice inclusion in the kit. Often times, a lot of us will forget that as with our face, we must also pay attention and give our neck some love! This product is "clinically proven to reduce crepiness by up to 33%, increase skin firmness by up to 17% and elasticity by up to 14%." 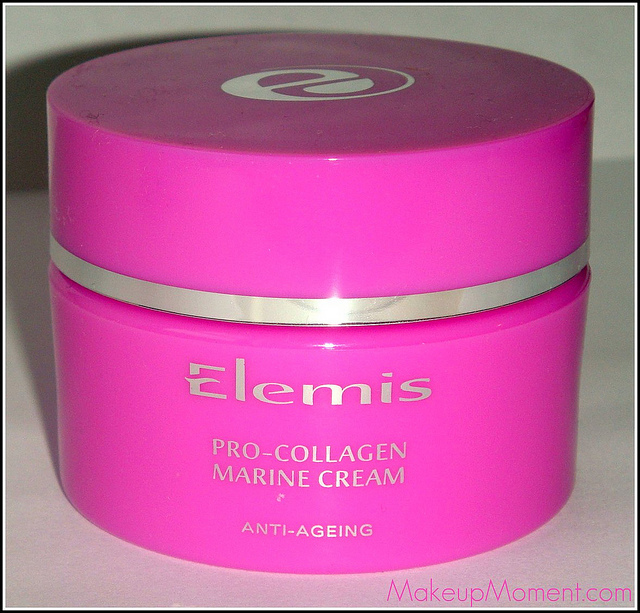 This cream has almost a thin, liquid-like consistency and it absorbs easily into the skin. The only thing I am not fond of is the scent. I don't really mind it, but its just not my cup of tea. Luckily, it does not linger for too long. I have applied this lotion to both my neck and bust, and the skin in those areas do indeed feel very soft. Although, I haven't really noticed much when it comes to firmness. Maybe its too soon to tell. Elemis Skin Nourishing Shower Cream- This definitely had to be my most favorite product out of the set of three. This shower cream is amazing. It contains camellia, macademia, jojoba, oat kernel, and wheatgerm. All these ingredients help cleanse and moisturize the skin. A little bit of product goes a long way, so this shower cream will surely last me a good while. The lather is very rich, and the fresh, baby-powder scent that lingers on my skin after I pat dry, is an added bonus. When this shower cream runs out, I am definitely going to purchase a full-sized version. I love it that much. You can purchase this amazing Elemis Think Pink Beauty Kit online at Time To Spa, Bergdorf Goodman, select Nordstrom locations, and by calling 1-800-7-beauty. Have any of you tried Elemis skincare products? Disclaimer: I received the products mentioned in this post by PR, for posting consideration. I am not being compensated for this post, and my reviews are 100% honest and my own. I've never heard of this brand before, but they sound really great! I also like their packaging a lot. I hope you get the WnW matte palette. You will love it. The packaging is pretty cute :) And yes, I will be on the lookout for the WNW matte palette, Thanks!